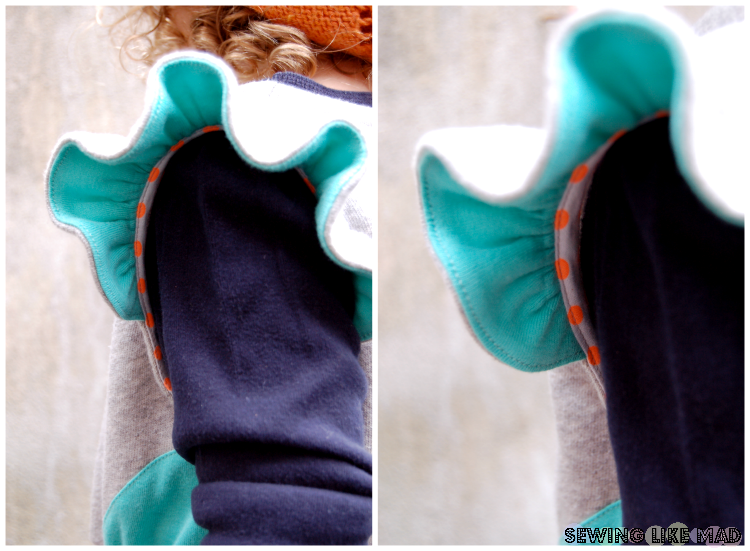 Sewing Like Mad: Five and ten Designs, Volume One - pattern eBook review. 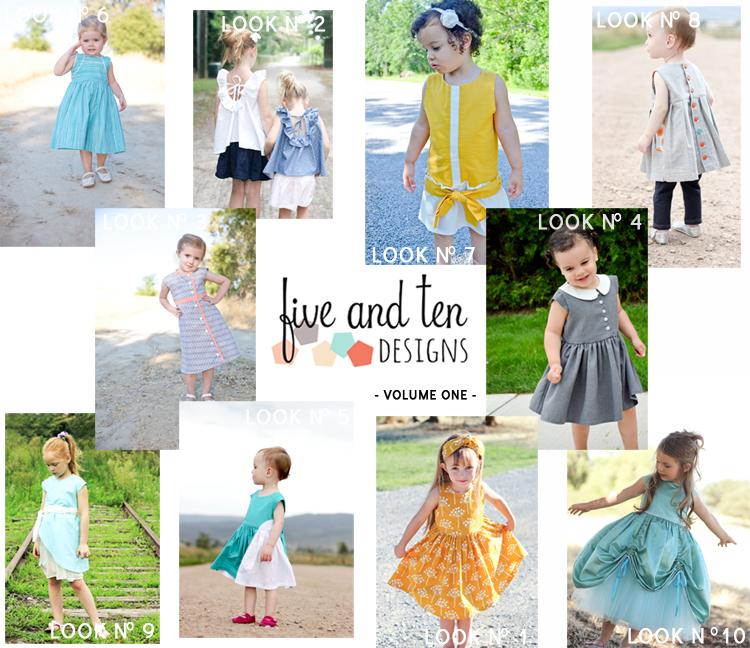 Five and ten Designs, Volume One - pattern eBook review. Gosh, this is a bit embarrassing.....no, no not the dress - I totally love that - but the amount of time it has taken me from I received my five and ten designs, Volume one eBook to me actually blogging about it. Red cheeks for sure over here! In fact it was the only thing on my looong to do list that I failed to do before the Project Run and Play madness started. So obviously it was first on my after-PRAP to do list. And the really sharps ones might wonder what took me so long since PRAP ended like two weeks ago (well, at least for the contestants.) Hmmmm, let me just say this dress has caused me A LOT of problems....all my own fault....argh, don't you just hate when you don't have anyone to blame for your own problems, ha! But let's start with the beginning.....the who's and what's. Five and ten Designs is founded by some very talented ladies: Jess - Craftiness is not Optional, Heidi - Elegance & Elephants, Stef - Girl. 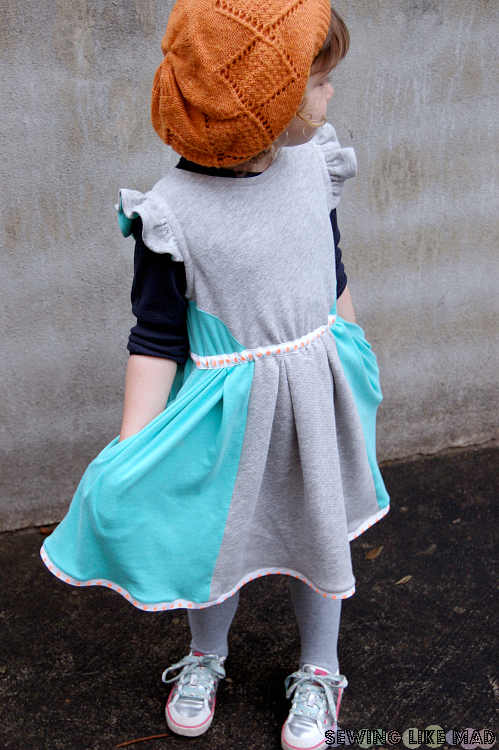 Inspired, Jessica - Me Sew Crazy and Delia - Delia Creates. 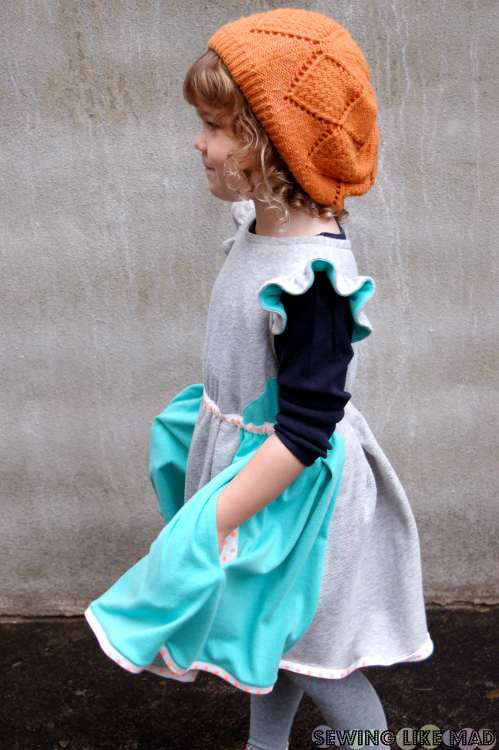 They have created a basic bodice pattern, graduated the pattern to size 12 months - 10 years old and then put it all together in an eBook together with two fully photographed and very well explained tutorials from each designer, on how to turn those bodice patterns into the cutest dresses. Together with the front and back bodice pattern also comes some sleeves, collar and pocket patterns used in the tutorials. 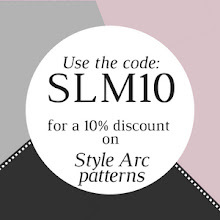 SO five designers and ten pattern alterations = five and ten Designs. Genius! Above you can see all ten looks. You can read more and purchase the eBook HERE on their website. 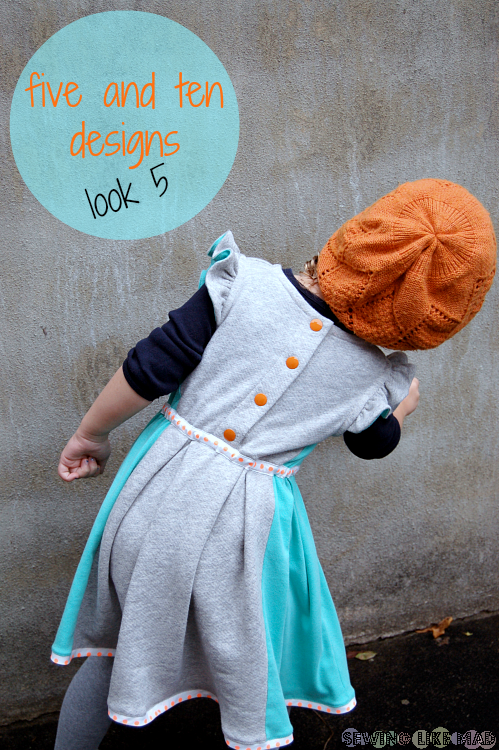 I choose to make look number 5 by Delia - Delia Creates. I don't even have to explain why, right. Yeah, color block...still obsessed! 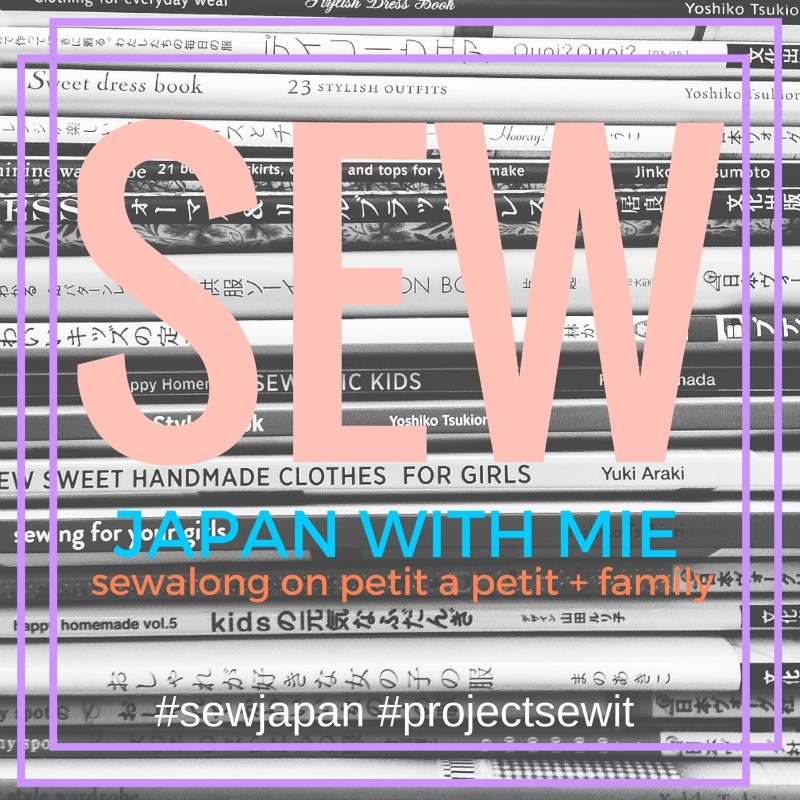 The basic pattern and all alterations are meant for woven fabric and this is where I made my first mistake....a mistake I always tell everyone, who wants to listen, not to do....do not make a knit dress after a woven fabric pattern. Knit requires totally different sewing techniques and sizing usually ends up different. Well, I thought I was prepared for these differences being an experienced seamstress but I guess this fabric had other plans! YES, let's blame the fabric!!! Let me say it this way....where are very few seams on this dress that I only sewed once...several up to three or four times. 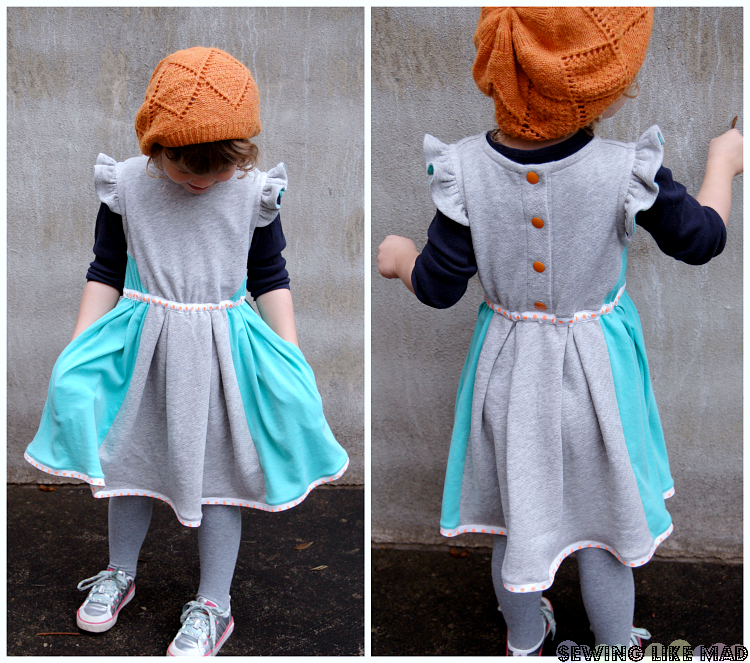 I have never been so close to giving up and cutting a new one in woven fabric but ahhhh, I just loved this combination and I know Evelyn totally prefers the knit dresses compared to the ones in woven fabric. So stubbornness won.....and at least I can say, now that it is done, the result was worth the trouble. I absolutely LOVE it! And so does Evelyn. Look at that smile. Every time we had a fitting (and there have been countless) is was a battle to get it back off her because she wanted to keep it on. And after the photo shoot she insisted on keeping it on. So the sewing started out well actually. The original also has buttons in the back. Because of the knit fabric I choose to put snaps in and no problems there. But before I tell you about my ridiculous fight with a sleeve opening, let me tell you about the little ruffles. The original have a little cap sleeve and I simply extended that and then gathered it. Easy peasy. Before I started sewing it, I wondered if I should put any interlining on but decided not, since it had not been needed in the neck opening. BIG mistake. It looked horrible and I had to rip off bias tape and ruffles again - oh wait, before I did that I also tried to put some elastic in the bias tape casing with no luck in the looking-good-department. So no other way around than ripping everything apart so I could put a strip of interlining all the way around the sleeve opening. Then onto sewing again and when both bias tapes were on again I realized I forgot to sew the ruffles on first. Yes, really! At this point I seriously considered to skip the ruffles but off the bias tape came again. Phew, but I really love that peek of neon dot you get there. But what gave me the most problems was the waist. Ohhh, I start sweating just thinking about how many techniques I tried before it finally worked. So with woven fabric you simply gather your skirt and sew it on your bodice, overlock, iron, done. 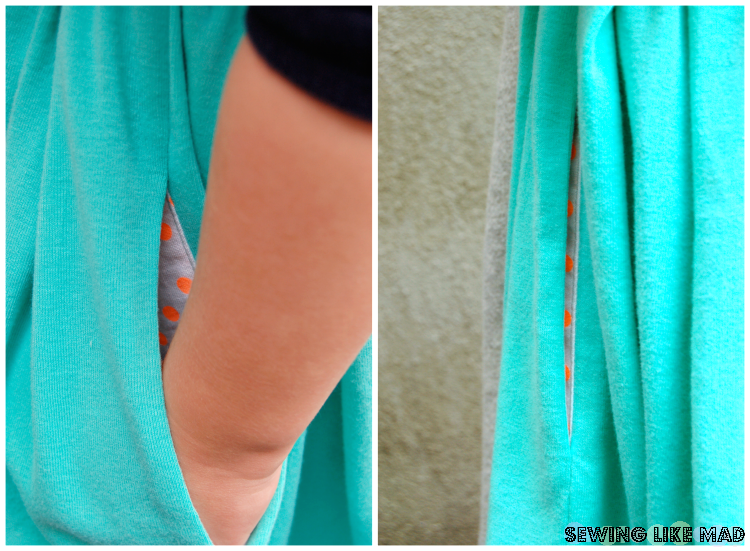 Both my fabrics are very soft and have a ton of stretch in it and it just looked super bulky and the bodice stretched by the seam because of the gatherings. My usually useful trick sewing elastic on the seam did not work....no, not even ripping it off and tightening the elastic did work. Whole skirt off again and then I tried making pleats instead of gatherings and that certainly helped but still not perfect. Then I tried gather the waist - now with pleats - with some shirring - nope, did not work. SO I added this bias tape casing and pulled an elastic through it - which I also had to do twice because the safety pin broke mid casing the first time - I mean SERIOUSLY!!!). But THAT worked, yippie! The original have pockets in the front seam between the two colors but I wanted them in the side so I simple cut the side skirt piece in two halves, added seam allowance and added my side pocket there. Again love the peek of neon dot. Lastly hemming knit can be problematic and - of course - it was. This solution worked perfectly though. A bias tape folded and simply overlocked on and then stitched 1 mm from the edge to prevent it from flipping upwards - especially after washing. And there you have it. My knit version of look number 5. Now that I have made all the mistakes you can, the next ones will be a walk in the park. And I really want to make more. Many more. You should ...(and you can) too. But maybe start out with a woven version just you know for your sanity's sake. Oh, and the very best part....it twirls....yay! Thank you ladies for providing me with your fabulous eBook and so sorry for the insanely long expedition time. Go to the five and ten Designs's site HERE. This looks so comfy to wear... I want one!! Me too Suz....BUT I am not going to make one, haha. It came out adorable Mie!!! Love it! What a funny story! I've had a similar nightmare with French terry. 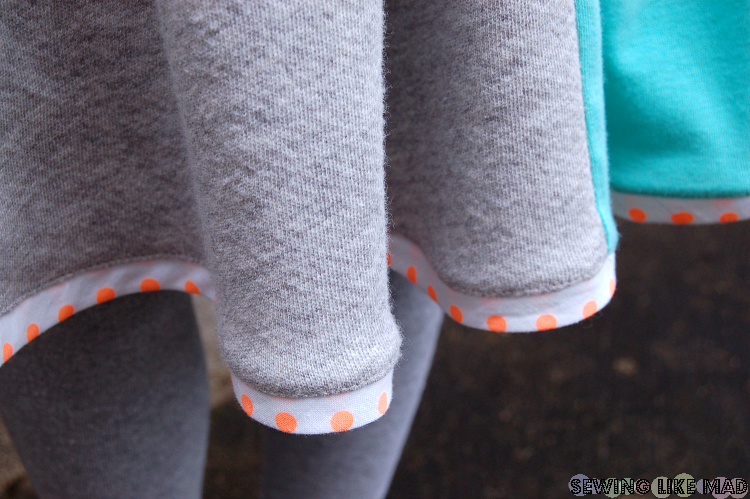 Its so hard to.work with.onlysimple designs for French terry! So the ebook providesonly a basic bodice? Does it fit well? French Terry really comes in so different varieties...from the stiff and almost no stretch version and to the suuuper soft and stretchy....and this is the last kind and yeah super hard to work with....but the result is yummy and comfortable. The bodice look right, but since I have only made something in knit from it I can't really say. But let me say it this way....It was not the fit I had problems with....it was the sewing techniques. Apparently I just consistently choose the wrong one. And there was obviously no help in the book because they are for woven. Totally my fault. Wow, SUCH a lovely dress! Really great work, you are so talented. Also the color combinations are great! Ooh this is super cute! Great job even despite all the troubles. Looks like you got a great garment in the end. I love how you combine colors and trims and make it all work! 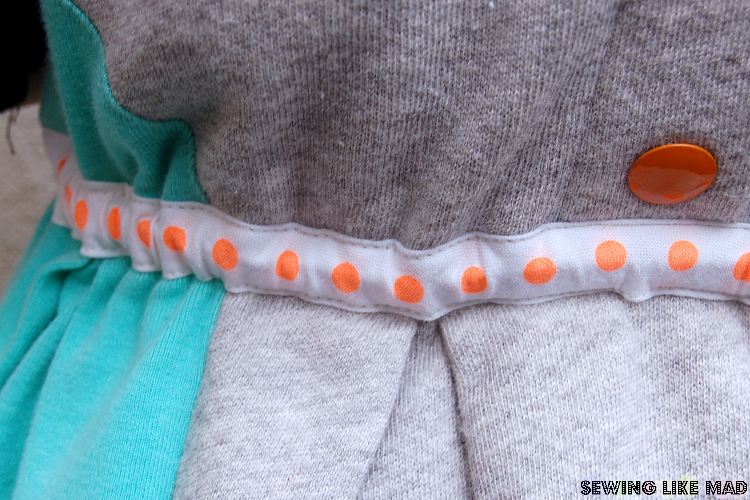 This is so perfectly sewn Mie! Despite all the trouble you ran into with the knit fabric, you cannot not tell one bit with how impeccably you brought this together! Lovely! Ha, I did not not bring it together impeccable...but it ended quite well ;-) Love your design Delia. You made a totally amazing version of this dress. Your eye for detail makes me drool and I want to sew like this some day!! 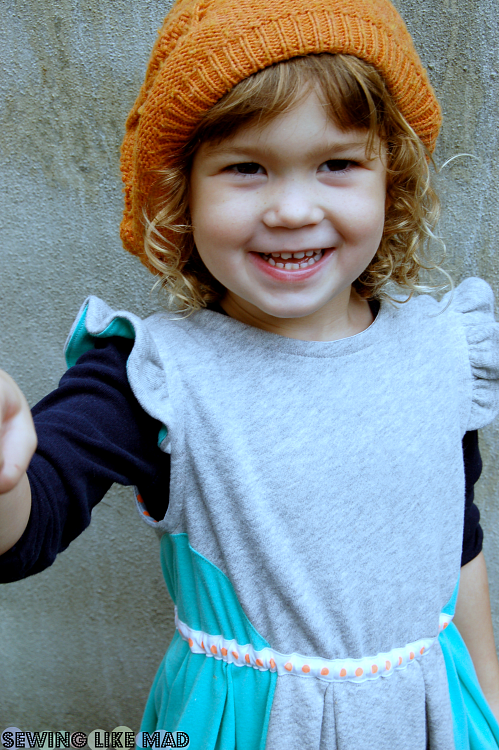 Thanks so much for sharing your adorable pictures of your cutie. i love it! and wow kudos to you for persevering...it seems like that fabric was out to getcha! lol! Super cute!! Love those details! The dress is just too cute you sure did a great color combination for the dress, I am planning to try it and will buy some dressmaking fabrics to use this weekend. 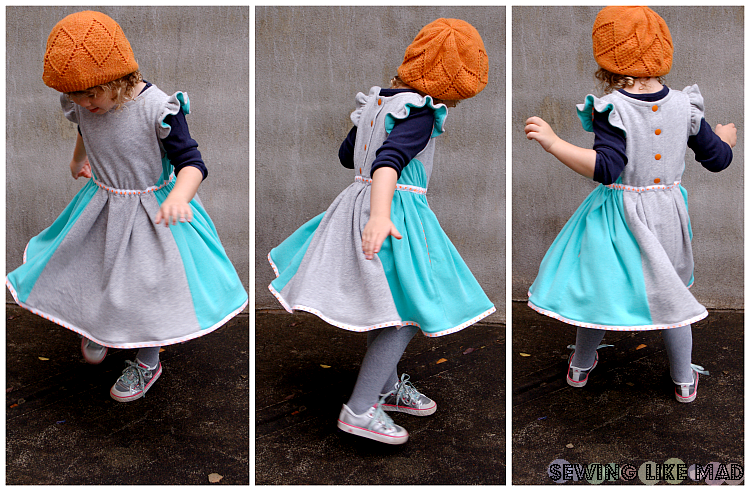 Girl Pleated Winter Skirt Tutorial, part two. Go to Patterns' Tour - Study Hall Jacket. Sewing for Kindergarten - sew along winners! !